Reference number for this case: 22-oct-54-Lusigny. Thank you for including this reference number in any correspondence with me regarding this case. In his 1958 book on the French wave of 1954, Aimé Michel indicated that on October 20, 1954, in the forest of Lusigny, near Troyes, in the Aube, Roger Reveillé, a wood merchant, was walking when his attention was attracted by a loud rustling like that of a flight of pigeons. He looked up and saw an oval craft at the level of the tree tops; which could have been 6 meters cross. At the same time, he felt a more and more intense heat while the craft "disappeared" vertically in a few seconds. The heat in the wood lasted for a quarter of an hour, to the point that Mr. Reveillé could not approach. When he did, he found that despite the rain, the ground and the trees were as dry as in the middle of summer. Many others have since copied the story. Ufologists, journalists, and authors Charles Garreau and Raymond Lavier, in 1975, brought their version; which they said was based on "press clippings" and their personal files: it was October 22, 1954, in the afternoon. Roger Reveillé was a logger and was in the woods of Larivoin near Lusigny. "I was following an alley when I heard a rustle similar to a flight of pigeons. But, instead of the birds, it is an enormous machine, of oval form and size of a cistern of semitrailer, which emerges at the height of the tree-tops. At the same time, I felt a torrid heat, which seemed me to become increasingly strong, while the machine disappeared vertically. I believed to suffocate. This heat had caused a thick fog, because of the evaporation of moisture. This lasted a quarter of hour well. When that it is dissipated, the ground and the trees were as dry that in full summer. And yet it rained." Charles Garreau specified that he managed to meet again Mr. Reveillé in 1972, and that he had not forgotten anything of this encounter nor of the fear which he had experienced. Aimé Michel indicates that on October 20, 1954, in the afternoon, in the forest of Lusigny near to Troyes in the department of Aube, Roger Reveillé, a wood trader, went in the forest when his attention was drawn by a strong rustle similar to that of a flight of pigeons. He looked up and saw, at the treetops level, an oval machine which may have had 6 meters on side. He felt an increasingly torrid heat at the same time while the machine disappeared vertically in a few seconds. The heat in the wood persisting for a quarter of an hour, so much so that Mr. Reveillé could not approach. When he then approached, he noted that in spite of the rain, the ground and the trees were as dry as they would have been in summer. That same afternoon 125 miles west of Turquenstein [sic], a lumber dealer M Roger Reveille, was walking near the Lusigny Forest, not far from a place called Troyes. It was raining hard as he made his way along a woodside road, when suddenly he heard a loud rustling sound as would be made by a flight of pigeons. Looking up, he saw at little more than tree top height, an oval shaped body of about 20 feet across. At the same moment he felt a wave of intense heat. In a few seconds the thing disappeared upwards. In the woods the heat was producing a thick local fog and it was almost a quarter of an hour before the witness could approach the site. When he did so, he found, in spite of the heavy rain, the trees and ground were quite dry as if exposed to strong sunlight. Lusigny Forest France. October 1954 Intense heat, ground & trees dry in spite of heavy rain. 78 feet. Mr. Roger Reveille saw an oval object, 6 m long, at treetop level, and felt intense heat from it. It took off vertically at great speed. Inside the woods, the heat had become intolerable and a cloud of dense smoke was forming under the rain. After 15 minutes the witness was able to approach the site, and he found the trees, grass, and ground perfectly dry. (Quincy; M 204). Roger Reveille saw an oval object, 6 m long, at treetop level, and felt intense heat from it. It took off vertically at great speed. Inside the woods, the heat had become intolerable and a cloud of dense smoke was forming under the rain. After 15 minutes the witness was able to approach the site, and he found the trees, grass, and ground perfectly dry. (Quincy). That night, it was raining heavily on the forest when Mr. Réveillé heard a curious rustle. He discovered an oval object moving along the trees. Soon, he felt a heat more and more intense, then the craft disappeared vertically. A fog (water vapor) remained for 15 minutes on the spot and when the witness was able to approach, he found that despite the rain, the earth and the vegetation were as dry as in full sun (MOC page 34). In this particular case, it is not possible to doubt that Mr. Réveillé was indeed confronted with a thermal phenomenon since a physical effect confirms its existence. If the senses of the witnesses had been abused, the water molecules that were vaporized would not have been sensitive to any form of hallucination. During certain observations, various physical phenomena (evaporation of water, melting of snow or ice, calcination of vegetation ...) proved that the feeling of heat felt by the witnesses did have a real existence. But it was not always so, quite the contrary. Charles Garreau specifies that he managed to meet again Mr. Réveillé in 1972, and that he had not not forgotten anything of this encounter nor of the fear which he had experienced. The author indicates that in 1954, on October 20 in Lusigny in the Paddle, Roger Réveille noted a strong heat at the passage of an oval aerial object, as it rained outside. Where the machine flew over the forest at a few meters of altitude, there was a thick fog, impossible to approach, which made think of a fire. In spite of the rain, the ground and the vegetation were dry. Paul Misraki indicates that in a book by Aimé Michel an observation of a flying saucer on October 20, 1954 is described as follows: "After the passage of a craft releasing an intense heat, a wood trader from Lusigny, close to Troyes, notes that in spite of the rain, the ground and the trees are as dry as in full sun." It also happens that witnesses attend the scene and immediately note the drying of the plants; let's take two specific examples: - At Lusigny in the Aube, Mr. REVEILLE saw on October 20, 1954, a saucer flush at tree-top level, a little ahead of him and he himself experienced "a sensation of intense heat". After the departure of the UFO he went to the place where he had seen it and found that the heat was "unbearable" and that "the trees were as dry as if they had been in full sunlight." One can hardly be more precise. 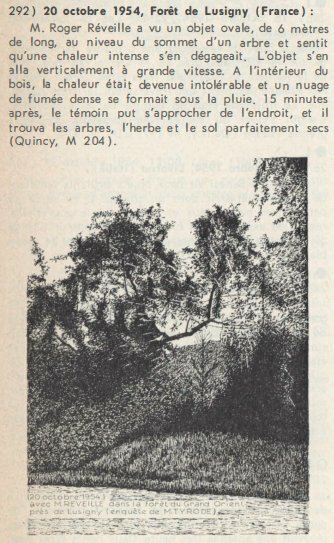 The two authors indicate that on October 20, 1954 in after midday, it rained, when a forester in the forest of Lusigny-sur-Barce in the department of the Aube on the level of the wood of Larivoin, following an alley, heard a rustle similar to a flight of pigeons. He then saw, at the level of the treetops, an enormous machine of oval shape and the size of a cistern. At the same time a torrid heat, which seemed to become increasingly strong, suffocated him, making him think that he was going to choke. The heat released by the apparatus caused a thick fog because of the evaporation of moisture. This phenomenon lasted fifteen minutes, and when it was dissipated, the ground and the trees were as dry as in full summer. Intense heat was the main feature of the reported experience of a Roger Reveille, who said that during a stroll through the Lusigny Forest a sound like a "flock of pigeons" alerted him to an oval machine some 18 feet in diameter some distance away hovering just above the treetops. Shortly thereafter the object zoomed straight up out of sight. 170. Rogerson, Peter. "The Catalogue." MUFOB New Series 4. Autumn 1976. #38. p.9. 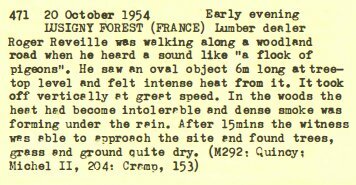 Report 10/20/54 Lusigny Forest, France 1830: 6m ovoid, intense heat, rain falling, steam, area dehydrated. LUSIGNY FOREST,FR:6M OVOID/TREETOPS:INTENSE HEAT:RAIN>DENSE STEAM:AREA DRIED! 1954 - During a rainstorm on this day in the Lusigny Forest in France Roger Reveille saw an oval flying object close to the ground. It was six meters long and hovered at treetop level. He felt intense heat coming from it. It shot up vertically at great speed. Inside the woods the heat had become intolerable and a cloud of dense smoke had formed under the rain. After 15 minutes the witness was able to approach the site, and he found the trees, grass, and ground perfectly dry. (Source: Jacques Vallee, Passport to Magonia: A Century of Landings, p. 235). In the Forest of Lusigny (France), Roger Réveille sees 1 oval object of 6 m length, on the level of the top of a tree and feels that an intense heat is released from it. The object from goes away vertically at high speed. Inside the wood, the heat became intolerable and a dense cloud of smoke formed under the rain. 15 mn later, the witness can approach the place and find perfectly dry trees, grass and, ground. The source is indicated as "Quincy". The website indicates that in 1954 on "the evening of October 20, a car was travelling on Route N-393 between Schirmeck and St-Quirin-en-Moselle; the driver was Mr. Jean Schoubrenner of Sarrebourg. About half a mile from the village of Turquenstein, in the forest of the same name, Mr. Schoubrenner suddenly noted, on the highway some distance ahead of him, a luminous body. He slowed down as he approached this object. When he was about 20 yards from it, he suddenly felt as if he had been paralyzed; his hands froze to the steering wheel. At the same moment his engine stopped and, as the car's momentum carried it forward, a sensation of increasing heat spread through his body. A few seconds later the object flew away toward the northwest and all these symptoms disappeared." And: "This heat sensation was reported again on that same afternoon in the department of l'Aube, 125 miles west of Turquenstein. It was raining hard that evening in the Lusigny forest, not far from Troyes. Mr. Roger Réveillé, a lumber dealer, was walking along a wood (-ed?) road when his attention was attracted by a loud rustling sound such as would be made by a flight of pigeons. Looking up, he noted, at tree-top height, an oval-shaped object perhaps 20 feet long. At the same time, he felt an ever more intense heat. In a few seconds the machine disappeared upward. In the woods, the heat was now intolerable and was producing a thick fog. It was almost a quarter of an hour before Mr. Réveillé was able to approach the site. He then found that, in spite of the rain, the ground and trees at that spot were as dry as if they had been exposed to full sunshine." The reference for the above is indicated as "Flying Saucers and the Straight Line Mystery by Aimé Michel, p 203-4". "Europe - France, Aube, Alsace"
"Troyes Latitude 48-17-60 N, Longitude 04-04-60 E (D-M-S)"
"Schirmeck Latitude 48-29-00 N, Longitude 07-13-00 E (D-M-S)"
"Aube Latitude 48-15-00 N, Longitude 04-05-00 E (Département de l’Aube)"
"Lusigny Forest Latitude 48-15-00 N, Longitude 04-15-00 E (Bois de Lusigny)"
"Turquenstein Closest I could find on a Google search was 'Forêt de Turquestein'"
"(Missing the "n" which is correct) -CF-"
"Turquestein Forest Latitude 48-33-00 N, Longitude 07-05-00 E (Forêt de Turquestein)"
"Sarrebourg Latitude 48-44-00 N, Longitude 07-03-00 E"
"UFO location (UFOCAT) Latitude 48.27 N, Longitude 4.29 E (D.%)"
"The following information was provided to me par a friend of my professional translator who lived in Troyes for many years:"
"There is an error in the spelling of the name. It is the village of Turquestein (now Turquestein-Blancrupt since the very small communes were often grouped together these last twenty years to simplify administrative management) in department #57 which is Moselle (in the northeastern part of France). It is located in the Forest of Turquestein, northwest of Donon, near Schirmeck, about 20 km west of Obernai. On the whole, it is located in the triangle formed par the cities of Saverne, Sarrebourg, and Molsheim (roughly between Nancy and Strasbourg). It is the D 393 (which means a departmental/secondary road and not a national/state road, which would be N 393, but maybe in 1954, it was a national road; it is possible) which goes from Schirmeck to Saint-Quirin (it has a section which is called D 392)." "In regards to the Forest of Lusigny, it was used in part for the establishment of an artificial lake with an ornithological reserve and a sports and recreation park in the 1960's called "Lac de la Forêt d'Orient" (Lake of the Forest of the Orient). It is located 10 km east of Troyes between the communes of Lusigny-sur-Barse, Géraudot, and Mesnil-Saint-Père. There remains, to the east of the lake, a large forest now called Parc Régional de la Forêt d'Orient (Regional Park of the Forest of the Orient) between Vendeuvre-sur-Barse and Brienne-le-Château, which certainly must have been called Forêt de Lusigny (Forest of Lusigny) at that time." "One must take into account the date and the change of local names in fifty years." Luc Chastan indicates that in the Aude in Lusigny sur Barce on October 20, 1954 at an unknown hour, "It is the afternoon, it rains. The witness, a forester, is in the Forest of Lusigny-sur-Barce on the level of the wood of Larivoin, and follows an alley, when he hears a rustle similar to a flight of pigeons HE sees then, at the tree-top level, an enormous craft of oval shape of the size of a cistern. At the same time a torrid heat, which seems to become increasingly strong, takes the witness at the the throat and he believes he is suffocating. The heat released by the craft causes a thick fog because of the evaporation of moisture. This phenomenon lasts a quarter of hour. When it dissipated, the ground and the trees are as dry as in full summer." The source is indicated as "Ovni, Premier dossier complet... by Figuet M./ Ruchon J.L. ** Alain Lefeuvre pub. 1979". The website indicates that in October 1954 in Lusigny Forest, France, "An object was observed. Physiological effects were noted. One object was observed." The website indicates that the source is Cramp, Leonard G., Piece for a Jig-Saw, Somerton, Isle of Wight, 1966. The website indicates that on 20 October 1954 in Lusigny Forest, France, an oval object, six meters long, emitted intense heat. "During a rainstorm on this day in the Lusigny Forest in France Roger Reveille saw an oval flying object close to the ground. It was six meters long and hovered at treetop level. He felt intense heat coming from it. It shot up vertically at great speed. Inside the woods the heat had become intolerable and a cloud of dense smoke had formed under the rain. After 15 minutes the witness was able to approach the site, and he found the trees, grass, and ground perfectly dry." "Roger Reveille saw an oval object, six meters long, at treetop level, and felt intense heat from it. It took off vertically at great speed. Inside the woods, the heat had become intolerable and a cloud of dense smoke was forming under the rain. After 15 minutes the witness was able to approach the site, and he found the trees, grass, and ground perfectly dry." "An object was observed. Physiological effects were noted. Traces found. One oval object, about 20 feet across, was observed in rainy weather by one experienced male witness in a forest for over 15 minutes (Reveille). A noise was heard." The website indicates that the source is "Vallee Magonia Database". The website indicates that on 20 October 1954 at 18:30, in Lusigny-Foret, France, an "object was observed. Physiological effects were noted. Traces found. One ovoid object, about 20 feet across, was observed in rainy weather by one experienced male witness in a forest for over 15 minutes. A noise was heard." The website indicates that the sources are Michel, Aime, Flying Saucers and the Straight-Line Mystery, S. G. Phillips, New York, 1958; Bowen, Charles, The Humanoids: FSR Special Edition No. 1, FSR, London, 1966; Vallee, Jacques, Computerized Catalog (N = 3073); Vallee, Jacques, Challenge to Science: The UFO Enigma, Henry Regnery, Chicago, 1966; Vallee, Jacques, Preliminary Catalog (N = 500), (in JVallee01); Vallee, Jacques, A Century of Landings (N = 923) (in JVallee04), Chicago, 1969; Cramp, Leonard G., Piece for a Jig-Saw, Somerton, Isle of Wight, 1966; Schoenherr, Luis, Computerized Catalog (N = 3173); Phillips, Ted R., Ted Phillips investigation files; Phillips, Ted R., Physical Traces Associated with UFO Sightings, CUFOS, Chicago, 1975; Hatch, Larry, *U* computer database, Author, Redwood City, 2002. 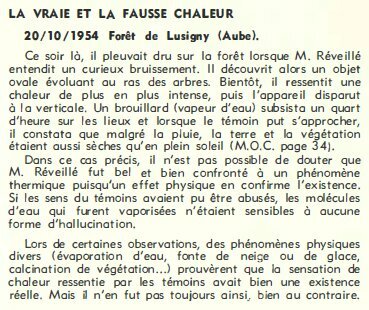 Occult buff and ufologist Claude Burkel indicates that in 1954, in Lusigny on Barse, farmer Mr. Réveillé [=Awaked], whose name is a "strange coincidence" to Claude Burkel, found in the Templar's Foret d'Orient, a strange luminous object which rose by releasing a heat so intense that in spite of the rain which fell violently the ground had remained dry during half an hour at the place where the machine had taken off. Claude Burkel wonders "whether this man entered in collision with a mysterious heavenly object posed on the ground?" and adds that it is a good idea "because in many cases of UFO landings the ground at the time of the departure of the craft is submitted to a heat stroke higher than 2000 degrees." He links the case to a history of a Simca 1000 car found with melted windows melted in the same forest in 1971. The author thinks that the affair in Fatima, Portugal, in 1917, that he thinks unexplained except as intervention of an unspecified cause which would not be extraterrestrial not be noncommonplace and would be the common cause of UFOs and appearances of the "Blessed Virgin" and other things, has as "ufological equivalent" the case of Lusigny in 1954, my page being given as reference. *Oct. 20, 1954 - During a rainstorm on this day in the Lusigny Forest in Aube department, France Roger Reveille saw an oval flying object close to the ground. It was six meters long and hovered at treetop level. He felt intense heat coming from it. It shot up vertically at great speed. Inside the woods the heat had become intolerable and a cloud of dense smoke had formed under the rain. After 15 minutes the witness was able to approach the site, and he found the trees, grass, and ground perfectly dry. (Sources: Aime Michel, Flying Saucers and the Straight Line Mystery, p. 204; Jacques Vallee, Passport to Magonia: A Century of Landings, p. 235, case 292). October 20 1954. Early evening. Lumber dealer Roger Reveille was walking along a woodland road when his attention was caught by a sound like a flock of pigeons. Looking up, he saw, at treetop height an oval object 6m long, and felt an intense heat from it. It took off vertically at great speed. Inside the woods, the heat had become intolerable and a cloud of dense smoke was forming under the rain. After 15 minutes Roger was able to approach the site, where he found the grass, trees and ground all perfectly dry. Note Gross 1954 dates this as 22nd, though almost all sources give 20th. "Skeptical" ufologist Peter Rogerson [pr2] wonder why I dated the case October 22, 1954 while "all sources" give the 20th. Firstly, not "all sources" give the 20th; second, all the sources giving the 20th just copied Aimé Michel's version. The fact that many copied it does not make it more certain. Aimé Michel had the wrong dates more than once. Here, Garreau obviously was more familiar with the case, since he heard the witness at least once, and had a "file" on the case. So there is not reason to favor Aimé Michel's date. The case is, admittedly, not "bulletproof": there is no hard evidence, only a signle witness report. It is nevertheless of high strangeness, with no obvious commonplace explanation, and the observation of the dryness of the area despite the rain was not a part of flying saucer folklore then. So, maybe Mr. Reveillé actually saw a craft of extraterrestrial origin. The "least worst" commonplace explanations would be a helicopter, or a purely invented story. [am1] "Flying Saucers and the Straight Line Mystery", book by Aimé Michel, English version of "Mystérieux objets célestes", S. G. Phillips Incorporated publisher, page 203, 1958. [mi1] "Les Extraterrestres", book by Paul Misraki, Plon publisher, France, 1962. [---] "Special Annotated Catalogue of Landings", compiled by Guy Quincy, typewritten document, unpublished, France, 1961. [gc1] "Piece for a Jigsaw", book by Leonard G. Cramp, Somerton Publishing Co publishers, U-K., 1966. [gc2] "Piece for a Jigsaw", book by Leonard G. Cramp, Somerton Publishing Co publishers, U-K., 1966. [---] "Challenge to Science", book by Jacques Vallée, Henri Régnery publisher, USA, page 380, 1966. [jv1] "Un Siècle d'Atterrissages", article by Jacques Vallée, in the ufology magazine Lumières Dans la Nuit (LDLN), France, #103, page 8, December 1969. [jv1] "Passport to Magonia - On Ufos, Folklore, and Parallel Worlds", book by Jacques Vallée, Contemporary Books publishers, USA, page 235, 1969. [jv1] "Chronique des Apparitions Extra-Terrestres", French translation of "Passport to Magonia", book by Jacques Vallée, J'Ai Lu publishers, France, pp 286-287, 1972. [ou1] "Cinq plus un, ou la boucle bouclée", article by the ufology group GABRIEL, in the ufology and parapsychology magazine Ouranos, France, Nouvelle Série #9, page 6, 4th quarter 1973. [gl1] "Face Aux Extra-Terrestres", book by Charles Garreau et Raymond Lavier, Jean-Pierre Delarge publisher, France, page 36, 1975. [pr1] "INTCAT Part 9 - An international catalogue of type 1 reports", compiled by Peter Rogerson, in the ufology magazine MUFOB, U-K., New Series #4, page 9, Autumn 1976. [am1] "Mystérieux Objets Célestes", book by Aimé Michel, Seghers publisher, France, page 270, 1977. [hj1] "Chasseurs d'OVNI", book by "François Gardes", pseudonym of Henri Julien, Albin Michel publisher, France, page 229, 1977. [mi1] "Des Signes Dans le Ciel (Les Extraterrestres)", book by Paul Misraki, reprint of "Les Extraterrestres", Robert Laffont publisher, France, page 101, 1978. [fm] "Calcinations, combustions, crémations spontanées et leurs rapports possibles avec le phénomène OVNI", article by François Mummy, in the ufology magazine Lumières Dans La Nuit (LDLN), France, #182, page 4, February 1979. [---] "Physical traces associated with UFO sightings: a preliminary catalog", book by Ted Phillips, Arcturus Book Service publisher, page 86, 1982. [mf1] "Catalogue Francat des rencontres rapprochées en France (Listing 800 1982) (2 - Suite)", list compiled by Michel Figuet, in the ufology magazine Lumières Dans La Nuit (LDLN), France, #257-258, page 20, November - December 1985. [lg1] "The Fifth Horseman of the Apocalypse - UFOs: A History - 1954 October", monography by Loren E. Gross, USA, page 72, 1991. [gc1] "UFOs and Anti-Gravity: Piece for a Jigsaw", book by Leonard G. Cramp, Adventures Unlimited Press publishers, U-K., page 153, 1997. [gc2] "UFOs and Anti-Gravity: Piece for a Jigsaw", book by Leonard G. Cramp, Adventures Unlimited Press publishers, U-K., page 216, 1997. 0.1 Patrick Gross September 28, 2003 First published. 1.0 Patrick Gross February 12, 2009 Conversion from HTML to XHTML Strict. First formal version. Additions [ud1], [ud2], [ud3], [cb1], [uf1]. 1.1 Patrick Gross April 13, 2009 Addition [lc1]. 1.2 Patrick Gross February 27, 2010 Addition [wa1]. 1.3 Patrick Gross March 6, 2010 Additions [gc1], [dj1], [mi1]. 1.4 Patrick Gross March 18, 2010 Addition [hj1]. 1.5 Patrick Gross June 30, 2010 Addition [jv5]. 1.6 Patrick Gross July 3, 2010 Addition [gc2]. 1.7 Patrick Gross October 25, 2014 Addition [ni1]. 1.8 Patrick Gross December 14, 2016 Additions [lg1], [ub1]. 1.9 Patrick Gross January 5, 2019 Additions [ou1], [pr1], [fm1], [mf1], [lh1], [pr2]. This page was last updated on January 5, 2019.